On the new city sidewalk snow-plowing rules: A few years ago, I lived on Donnelly Ave. (central Columbia) and they were talking about building sidewalks on both sides of the street. I approve (mostly) of making the streets more walkable and bikeable. But if this latest command had arisen at the time, I believe we would have seen a populace uprising! 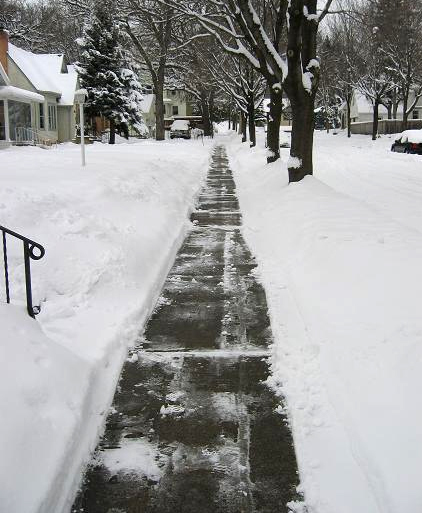 LOVE your letter/story about sidewalk snow removal! Well written and with a bite to it. I am proud of your voice! Keep it up! Dear Members of City Council: I write to urge you to reject the proposed snow removal policy and indeed to weaken the existing policy. The following focuses on requirements for residents. The requirements for business owners may be different, and I do not address them. First: Requiring residents to remove snow is a very significant burden (physical or financial) when there is a heavy snow fall. It will surely lead to some health problems (e.g., heart attacks) for those unable to afford to pay for its removal (or purchase a snow blower). Second: In a town like Columbia, where the snow typically melts within a week or so, it is very probably inefficient to require snow removal. For most residential areas (e.g., where traffic is low), the costs do not justify the benefits. People can walk in the streets. Finally, where it is worth removing the snow, it is far more efficient for the city to do it, even if this means slightly increasing taxes, or cutting back elsewhere. I conjecture that the total financial cost of each resident paying someone to clear his/her section (or the imputed cost of doing it him/herself) would cost three times as much as if the city simply plowed the sidewalks. It therefore seems crazy to require residents to clear the snow. I therefore urge you not to strengthen the requirements for residents to clear sidewalks, and indeed I urge that you weaken them. Either the city should clear them, or residents should be free not to clear them.